Welcome back on D.A.I.D – or Day After Indulgence Day. Days like Christmas, New Years, my birthday etc. are hard on those keeping tabs on their intake. As a runner I have the unfortunate tick of translating every piece of food or drink consumed into corresponding miles it will take to compensate. D.A.I.Ds come with a stark reality there is no way in hell I could ever break even from the day before… sigh. To my credit I did make a small recovery into the damage with a midnight run which, if nothing else, does help to beat down the inner guilt. The good news is I was able to crest over a running goal I had set, but we’ll cover that in an upcoming post. Instead, I bring you another post from the Yellowstone National Park trip. Isn’t it cute! This little guy or girl made an effort to come out and greet us as we were enjoying a picnic in the park. We were visiting the park with the Makutas back in May of 2013 (note, any comments from my brother regarding the fact this is the end of 2015 will be duly ignored hehehe). I thought it would be fitting to stick with the squirrel theme seeing as how I covered another member of the Squirrel family in the last post (link here). 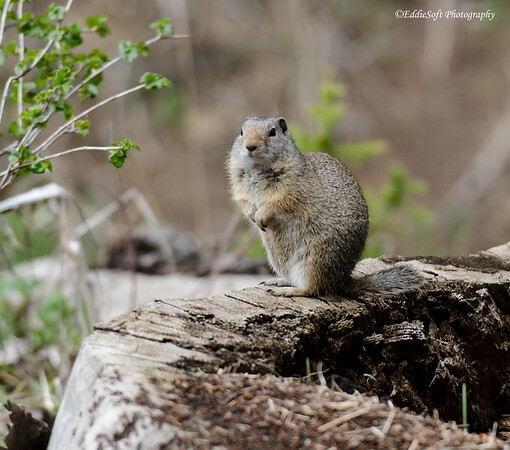 Hit the jump to see a few more pictures of this stocky Squirrel! I will admit I am not up on my Squirrel identification techniques and therefore my ID assessment may be called into question. 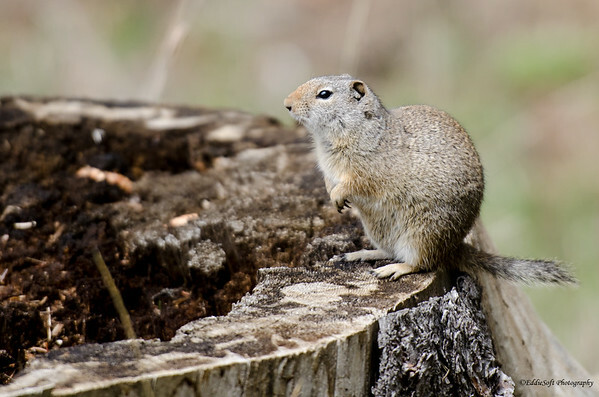 I did do some quick research (limited since this creature does now have feathers), and decided the best fit from my Audubon Field Guide to the Rocky Mountain States is the Uinta Ground Squirrel. It has sandy brown features, cinnamon ears, a tail, 4 feet and a nose so good enough fit for me. 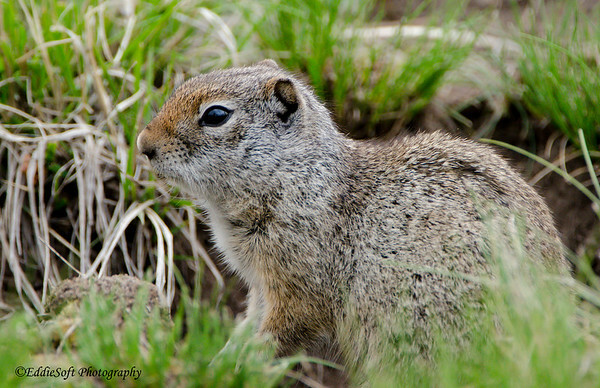 Oh, and the guide says they are uber-common in the Yellowstone and Grand Teton areas so I have that going for me. 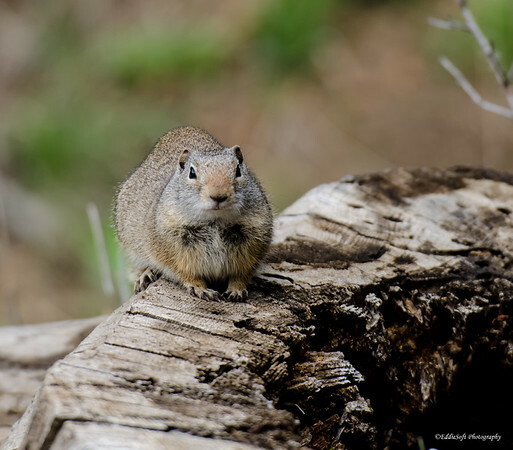 Squirrels in general are great photography fodder due to their highly expressionist traits. They also tend to stand relatively still for periods of time as they try to determine if you are friend or foe – actually, it is probably more like deciding if their visitors can be shaken down for food or not. The latter proven by the fact this one popped up as soon as we started putting food on the picnic table. By the looks of it, this one was having no problem sustaining itself in the park! One very interesting thing about this particular specimen was its total lack of regard for another resident of that particular pull-in area. You can kind of make out the brown-red mass in the foreground of the picture above. At first I didn’t think much about it .. until it started moving! Them be ants! Apparently the squirrels are more tolerant of these creepy insects especially this one seeing as how it basically had no problem hanging out less than a foot away from the horde. I did just check and they do not really eat ants so that dismissed one theory I had. Next option is they carry little mini-magnifying glasses in their pockets and pass the time when they’re not shaking down tourists to fry those little suckers. Shall we go see what interesting things Wikipedia might have on these furballs. 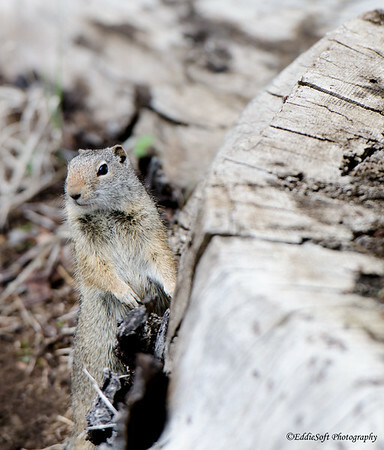 Another mystery solved – their odd name comes from where they were first located – the Uinta Mountains. That primarily Northeastern Utah range is known to be the highest range running East to West in the continental US. Be sure and thank me later if you get that question on Trivia Crack. They are apparently only active a few months a year entering hibernation in late July/mid August and emerging in the March timeframe. I’ll leave you one other education point – when they are active they are diurnal. Which for the uneducated means they literally use two urinals at a time. 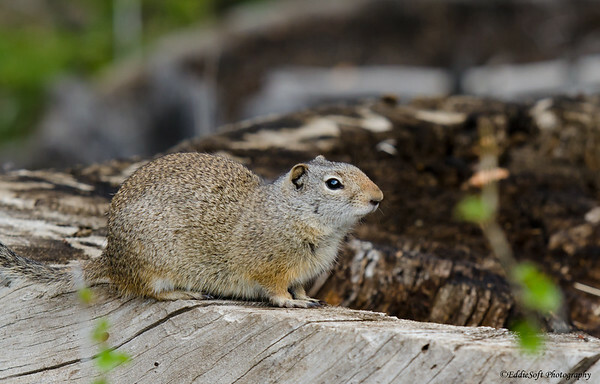 Apparently this gives them the more common human trait of being able to write their name in the snow – it seems the Uinta Ground Squirrel chicks use that as a selection criteria and those that can produce the best fonts get the pick of the crop. Hopefully everyone had a merry Xmas and didn’t indulge at the food trough like I did ha! It is, you know, the end of 2015. Nevertheless, regarding these pics, which are old, I’ve never heard of this squirrel or the mountain range, although I’ll gleefully let you know if it comes up in Trivia Crack. Another cute furry animal–I think this fascination means you really have to get a cat. 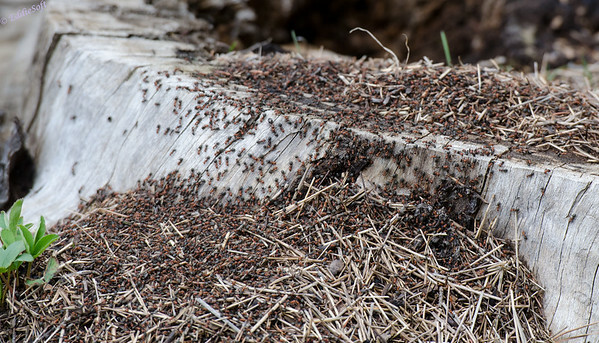 Those ants are horrific sight. Good thing you didn’t walk over there. There was a cartoon in today’s paper where the adult Anteater asks the kid Anteater whether he cleaned his room, and he said he did and the adult Anteater scolds him because how’s he ever going to attract ants that way. I looked up diurnal and found that humans are diurnal as well, so I’m awaiting the next snowfall to pick up chicks. Keep up the rodent posts! I do not like cats and trust me, these cute and cuddly creatures do not have killing their master on their mind 7×24 (as we know cats do from that well known research project). Oh, now, I’m helping my challenger – here’s another hint, always pick Drew Brees for ALL football questions – always! hehe- I may have taken liberties with my definition but good luck with the ladies – I heard they prefer cursive.